How to play Blu-ray movies on LG TV via USB? We have many ways to enjoy our favorite movies on TV, such as movie channel, Netflix, play DVD via DVD player, watch Blu-ray via Blu-ray player, play downloaded movies on TV via USB, cloud, stream movies via HDMI, etc. Have you ever thought about how to watch Blu-ray movies on LG TV (Smart TVs, 4K Ultra HD TVs, Super UHD TVs, HDR TVs, OLED TVs, LG SIGNATURE) via USB? If you too have found yourself in a similar or related situation where you either want to watch Blu-ray on LG TV, you are bang on reading the right page. Videos, movies, and other media content have majorly taken a digital turn with the change in time and technology. With more and more streaming sites, almost all types of video contents are available online. Still, if you love collecting your favorite videos on Blu-ray and have a great collection lying with you, why only restrict them to playing on a Blu-ray player? You can enjoy your movies easily by transferring Blu-ray movies to USB stick. Moreover, the transfer also makes it easy to share the videos with your friends. Acrok Video Converter Ultimate is an expert Blu-ray Ripper that allows converting Blu-ray discs to LG TV best playback format, and transferring them to the desired device, such as Galaxy S10, iPad Pro, iPhone XS Max, Galaxy Tab S4, etc. Blu-ray video format cannot be played directly on LG TV or Samsung, Sony, Panasonic, Sharp, Vizio TVs and thus the major step in the entire process is to first convert Blu-ray to your TV supported format. Copy Protection of the Blu-ray makes the task of converting them to another format a little tricky. This best Blu-ray Ripper is an excellent conversion tool that supports over 1000 formats in addition to a range of devices for conversion purpose. The program ensures lossless quality conversion at super fast speed with its APEXTRANS technology, GPU acceleration and optimization for a multi-core processor. The software supports all major versions of Windows and Mac OS and features simple interface to be used by expert and novice alike. – Convert Blu-ray disc to 4K MP4/4K MKV, for multiple 4K players. – Convert Blu-ray to MP4, MKV, AVI, WMV, ect. popular formats. 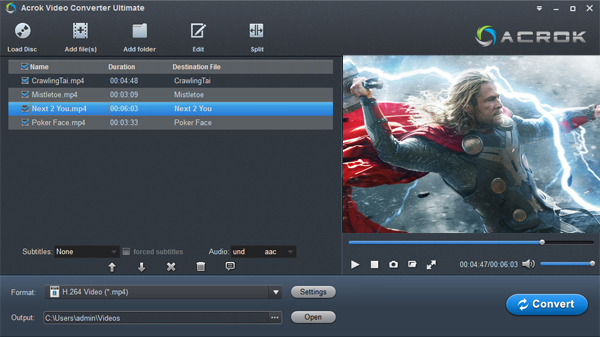 – Customize Blu-ray videos at will with powerful editing functions. 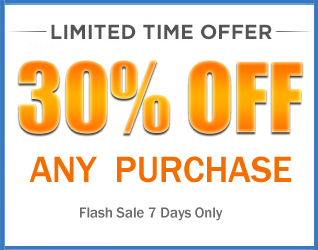 – Convert 2D Blu-ray to 3D movies for more pleasure. – Fast conversion speed with NVIDIA CUDA acceleration technology. 1. Install and run Blu-ray to LG TV Converter. Then you will see an interface as below, you can just start by clicking “Load Disc” at the top left or you can edit your Blu-ray by clicking the little pen sited left leveling with your Blu-ray’s name. You can edit it into 3D format or cut short or add some effect to it. It can do whatever under your need. 2. H.264 MP4 is the best playback format for LG Smart TVs, 4K Ultra HD TVs, Super UHD TVs, HDR TVs, OLED TVs, LG SIGNATURE, so you can choose H.264 MP4 as output format here. You can get it in “Common Video” or “HDTV” category. 3. To save the converted file at the desired location on your PC, choose the destination at the Output tab. Finally, click the “Convert” button to go ahead. 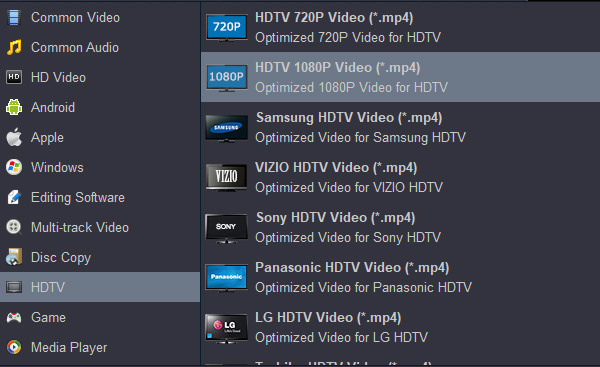 With the completion of the task, Blu-ray files will be converted to LG TV compatible format and will save on the desired folder on your computer. 4. Copy and transfer the ripped movies to your USB flash drive, insert your USB stick into the LG TV’s USB interface. Now, you can watch Blu-ray movies on LG TV without Blu-ray player.